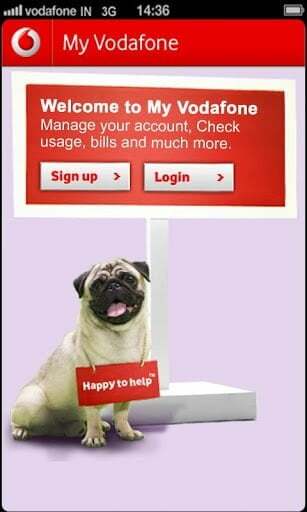 Vodafone today announced the launch of ‘My Vodafone’ App for its customers for iOS, and Blackberry platforms. Earlier in April, 2013 this App was launched for Android smartphone users only as we shared on TelecomTalk. From paying phone bills, recharging your prepaid account, tracking service requests, or simply subscribing to the best offers, ‘My Vodafone’ App helps its users on Android, iOS and BlacKberry to do everything on the move. Similar to Bharti Airtel’s “my airtel app“, and BSNL’s My BSNL App, Vodafone India’s ‘My Vodafone App is is free to download application includes ability to check outstanding postpaid bills and un-billed amount, recharge prepaid accounts, make online payments, activate or deactivate any VAS service on postpaid and prepaid mobile etc. Users can also raise requests/ complaints and track their status as well as he/she can view their current 2G or 3G data plan details and data usage. ‘My Vodafone App’ works on an advanced technology that allows real-time integration with Vodafone systems for accessing information on billing, recharge and data consumption. The app can be seamlessly used on multiple types of data connectivity such as Vodafone GPRS/3G, Non-Vodafone connectivity including Wi-Fi (Registration requires Vodafone Data Connectivity). The app is available for FREE across all three leading OS App store – Android, BlackBerry and iOS; however usage and download will be billed as per the subscribers data plan. Vodafone, Please correct Recent Deductions for call charges and sms properly in Android App.. Currently your My account section on website shows it correctly & your own App says different which is wrong. !! I have used this app Currently your My account section on website shows it correctly & your own App says different which is wrong. ! !